A calming master bedroom is a typical top-of-the-wish-list request when a family sets out to build a new home. However, creating a unique space can often pose a bit of a challenge for designers. 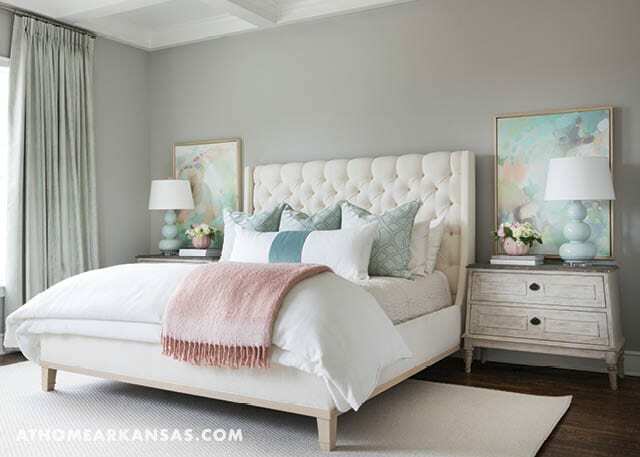 When Katie Henry of Katie Grace Designs was called on to design a Fayetteville master bedroom, the homeowners knew she was sure to deliver something unexpected and delightful. 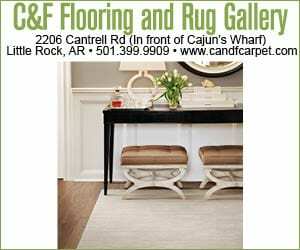 “They wanted the room to be serene and elegant yet livable and durable for their family and young kids. I always like to create master bedrooms to feel like a ‘retreat’ for the homeowners,” Henry says. 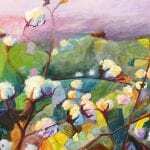 Read on to see how she used color, and perhaps a little bit of geometry, to create a tranquil space. A unique color palette of mint and blush lends a feminine yet organic flair in the spacious bedroom. “The colors we chose definitely create a calm, soothing, and romantic atmosphere for this couple,” Henry says. This combo can be seen vividly in the bedding accessories. A cream, tufted, upholstered bed serves a neutral backdrop for teal and mint pillows in varying patterns and textures. Quilted linens add luxury and comfort, while a blush throw pops against the crisp white duvet. “We used a neutral palette throughout this entire home but wanted to bring in pops of color through the artwork and accessories,” Henry says. The noticeably symmetrical design creates a formal, balanced feel in the master bedroom. His-and-her, matching chests serve as nightstands, while the table accessories—including stacked ball lamps, books, and floral arrangements—are also mirrored in placement. Complementary abstract paintings by artist Joanna Posey cap off each bedside vignette and tie together the soothing colors and calming nature of the room. “We worked with Joanna by sending her the fabrics and finishes we had picked, and she created the most beautiful finishing pieces of artwork to pull the entire room together,” Henry says. 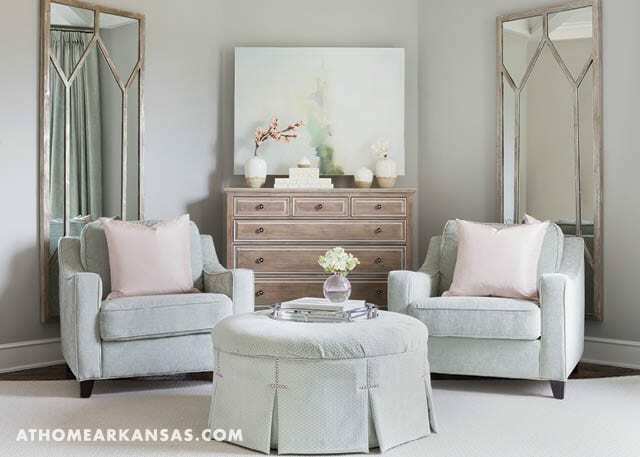 Opposite the bed, a reading nook is another balanced focal point, featuring club chairs, an upholstered ottoman, framed mirrors, and a dresser. 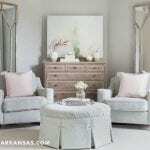 The color palette is continued with pops of pink in throw pillows as well as another abstract painting in hazy blues and greens.